Lowell, MA – Contract Logix – a long-time developer of contract management software – has published a new whitepaper titled An Introduction to Contract Management Software. The whitepaper is an educational primer on contract management digitization and is essential reading for anyone who has a role in drafting, reviewing, approving, or managing contracts. It leverages knowledge and expertise gained during the company’s 12+ years delivering technology solutions to legal and other contract-focused professionals. 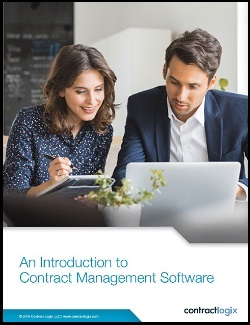 The whitepaper addresses contract management software’s most important value proposition for legal teams — its ability to identify and help mitigate areas of risk that exist in all contracts. This risk can take many forms, including: missed deadlines or milestones, failure to meet contractual obligations, version-control problems, or using non-compliant contract language. Access the whitepaper without requiring your contact info, or download it in PDF form here.